We don’t normally cover new player signings on here – mainly because, if you imagine that some 40 teams are going to be announcing 20 odd players each over the course of the summer, that means that we would never have time to do anything else – and we are already trying very hard to get the new 2017 NIHL Yearbook ready at this particular time! Having said that, this particular signing is rather special as Widnes Wild’s new Latvian forward Elvis Veldze was previously with the Fylde Flyers team that we used to work with and so is worthy of a mention. The returning Widnes Wild player coach, Ollie Barron, looks to be putting together a very strong team for the forthcoming NIHL North 2 (Laidler) season with many of the top names from last season coming back for another crack at the league title and, with the signing of a second import to boost the line-up, he has certainly set his stall out. Elvis is a very exciting player to watch. 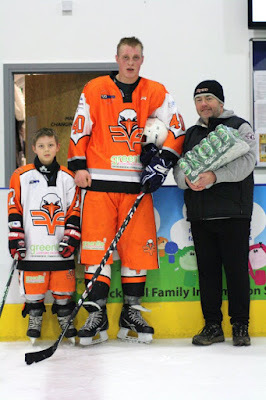 He is very tall, has a rocket shot and used to score goals from behind the half way line – although that was, obviously, easier at the Flyers‘ SubZero home rink in Cleveleys which was only half the size of everybody else’s….! Elvis was the Fylde Flyers’ top goal scorer In the 2011/12 season with 33 goals in 25 games and finished their second top scorer overall with 33+20, behind another current Widnes player Bobby Caunce who was top with 27+37. The following season, he had trouble balancing work / training and travel commitments and only managed 5 games for the Flyers in which he scored 2+1. The Flyers struggled to be competitive in the two years that they existed and were unable to develop as a team as they had trouble attracting new players to come and play on their “compact and bijou" playing surface. This meant that we probably never got to see the “real deal” Veldze. He has spent time in the intervening years playing back in his native Latvia so will, undoubtedly, return to these shores a more experienced and rounded player. It will be interesting to see how he fares this season playing with a competitive team on a fully sized rink!